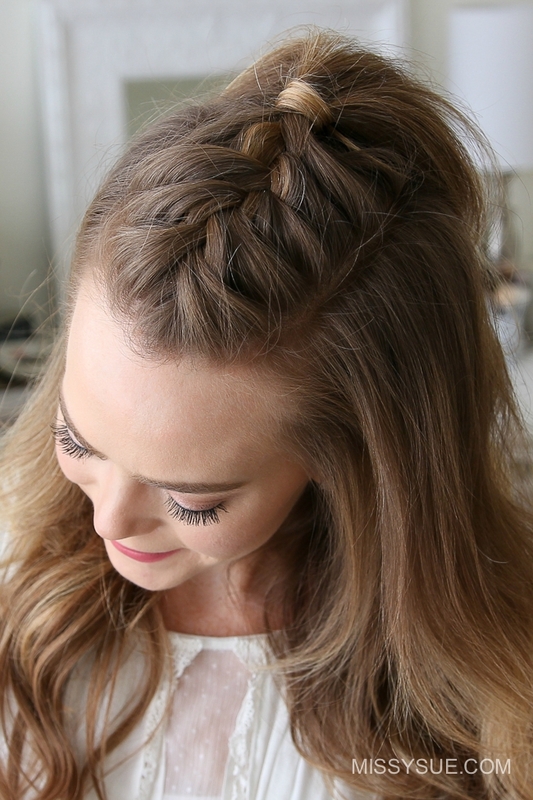 Over Thanksgiving weekend, my friend was asking me how to create this French Mohawk Braid. Since half up hairstyles are some of the most requested tutorials I thought it’d be perfect to share a tutorial with you as well! Step 1 / Begin by dividing out a section of hair for the braid so create two parallel part lines at the corners of the forehead and clip down the bottom hair. Step 2 / Pick up a small section near the hairline and divide it into three smaller pieces for the braid. Step 3 / I’m going to start by crossing the right strand over the middle and then the left strand. Step 4 / Now cross the right strand over the middle, pick up a new section and add it into the middle strand. Step 5 / Then cross the left strand over the middle, pick up a new section and cross it into the middle strand. Step 6 / Repeat these steps crossing the side strands over the middle strand while bringing new sections into the braid until it reaches the crown of the head. Step 7 / Tie off the end of the braid with a clear elastic band. Step 8 / Then to hide the elastic, divide out a small section of hair, wrap it around the elastic band and pin it underneath with a bobby pin. Step 9 / Gently back comb the ponytail a little bit to add some volume. Step 10 / Spritz the ponytail with some hairspray for hold and smooth down any flyaways. And … I wanted to ask you if you could make a video about cutting your bangs. Is that, I really love your hairstyles. I have a really old tutorial for how I cut my bangs. You can easily find it by searching “Missy Sue Cutting bangs” Thanks!